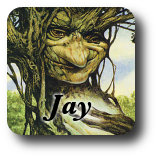 7/15/2014 - This guy is meant to reward you for playing lots of different lands. I like the basic idea, but I iterated it on and want to show you some other options and discuss the merits of each. She gets lands and learns something everytime she visits a new and distant land. Cool. I'm not happy that allowing it to find any land forces it to be rare, and I'm strongly tempted to restrict it to basic lands. While we never want to go too cheap for a card that gets at least one land just by attacking, and potentially several land, leaving it at 2/2 makes it a challenge to keep swinging with her. Challenges are fun, and at 3 mana, this can help a player stalling on three land. I know coming in this last one isn't the best idea, but I have to share it for the cute factor. It's more elegant than the first two in a way, but more complex in practice. I can honestly see arguments for any of these, but I would lean toward the uncommon that doesn't grow in a vacuum for purity of purpose and design. What do you think? Whenever ~ attacks, reveal the top card of your library. If it's a land card, you may put it onto the battlefield tapped. Whenever a land enters the battlefield under your control and you control no other lands with the same name, put two (?) +1/+1 counters on ~. When CARDNAME attacks, draw a card. You may play an additional land this turn. basically a 1/1 elf that casts explore every time it attacks. 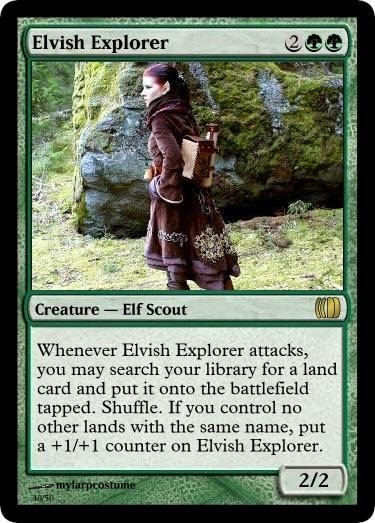 I love the idea of an elf that casts Explore whenever it attacks, though I can't help but think how the first half of the ability raises an eyebrow, and how people would react if the second sentence were omitted. You could, at least in theory, skip the "Draw a card" line. Explore needs it cause it has the secret spell text "Discard this card" on it, but this doesn't. When ~ enters the battlefield, you may search your library for a basic land card, put it onto the battlefield tapped, and shuffle your library. Then, put a +1/+1 counter on ~ for each basic land type among lands you control. Elvish Explorer has power and toughness equal to the number of basic lands you control. Whenever Elvish Explorer attacks, you may search your library for a basic land that doesn't not share a type with any basic land you control. Put that land onto the battlefield tapped. Shuffle your library afterword.